I think the last young people went to bed around 4.30, but I did have a reasonable night. Got up at 7.15 a.m. and had breakfast. Later I went for a walk in town and soon I was on my way to some national monument, which I had no idea how far was. It showed up to be the remains from some pre-inka fortresses, that covered a minor mountain side. The local "Hammershus" (the ruins of a castle on Bornholm, DK), except that it wasn't free. Fair enough, if it shall be preserved it will cost. You could also walk to the top of the mountain behind by a curvy footpath, and there should be a brilliant view. I asked if I could do that part later, as I had nothing on my head and no water. I could. He'd remember I had been there and paid. There WAS a remarkable view, both over the 'Salar' and to the Moon Valley to the other side. The wheather changes quickly. Sunshine and hot in the morning. Now in the afternoon it's cloudy and windy. 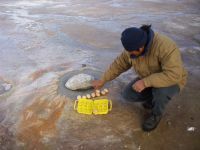 I have joined a tour to 'El Tatio' geiser in the early morning. Starts at 4.00 a.m. while it's still dark. So that we can be there when the geiser is at the maximum height. It's been a dramatic day. I started at 3.50 a.m. realizing that my bike was gone. What could I do but to run around the site with a flashlight in my hand, to see if anybody had moved it, just for fun? Then the minibus arrived and we drove towards the geiser area in the worst road I'd seen until now. Some clouds that disappeared revealed Orion upside down. I didn't realise it first until I saw the sword sticking up. I couldn't concentrate on the geisers (mostly small bubble baths) and I hadn't brought my towel as it had been hanging on the bike, so I wasn't in the hot basin either. On the way up there it soon started to snow and there was both in the road and to the sides. Sometimes it was drifting and I considered the possibility of getting back at all? There were two minibusses in front of us and we were later overtaken by another, so at least 4 cars from different bureau's on the way. Juan, our driver, was driving nicely so he was way back. I took some photos but it was extremely cold. Besides we were up at 4400 m. Juan was entertaining with stories of people falling into the 70-80 degr. hot water. One had survived but was 2 years later killed in a car crash. At one spot you could feel the shaking of the rock from the boiling water underneath. We were some that had to feel it. The others were very nice but always wanted to do or see something extra, so we were late to leave. 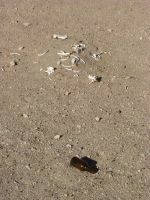 I was just interested in getting home to find out what had happend to my bike. The route back was alright until we got stuck in the snow. We just missed 200 m's before the road would be drivable again. At minus 10 degr. and at 4400 m that is no laugh. Juan who was supposed to stand up as the leader seemed puzzled, but using hands andd feet we were some that started clearing the road. By strong effort we had the car pushed 10 m. Encouraged of the success we continued with 5, 15, 50 m, but it was still far to go, and we were still at 4400 m, so when I had been pushing some minutes passed before I was breathing normally again. 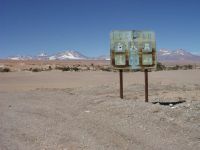 I didn't tell about the italians I'd read about, they got stuck somewhere in Bolivia in a 4WD and weren't found alive. We could easily walk past the snowy part but there would still be 40-50 km to walk at the same height. But we had passed a house at an abandoned mine maybe 5 km's before, and I'd seen smoke from the chimney, so there would be people there. Juan comforted us that if we didn't arrive back home before some time somebody would come looking for us. 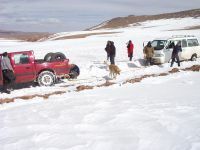 To put it shortly: After a couple of hours, where hard work helped feeling warm, a 4WD expedition car showed up with snow chains and a trail rope and within 5 minutes we had been pulled through the snowy parts. Nearly back home we met "the rescue team", a KIA minibus just like ours. If we'd had to wait for them up there we wouldn't have been saved until 5 p.m. and they'd probably have had to leave our car behind. Now we were home at 5 p.m. When I as the last was dropped at my camping site I asked Juan if this was first experience of this kind, and he admitted it. It's an excuse that there hadn't been snow in the geiser area for the last 20 years (they say). When I return at my tent the bike is still not there and the tent is literally floating only fastened to the 4 big rocks in the corners, there's a storm going on. As fast as possible I get the tent back on to the ground and find the owner at last, who accidentally had thought it too risky to let my bike stay outside, so he'd taken it to a locked room. If only he'd woke me up to tell!!!! Encouraged by this I walk back to the tent to find out it's not only my belongings in the front room that's "rolled" in dust. In the doubble entrance has been a 10 cm gap with only moscito net, so ALL is covered in a fine brown layer of dust. This dust that I've already had in my nose for the last few days, is extremely fine-grained and spread all over. Tha sleeping bag has been hit the worst. After heavy banging and sweeping some og it comes off. The rest will have to stay. Exhausted I lay down with a liter of juice and a cheese bun lying thinking a bit. Then I hear someone calling. It's Christel and Daniel who participated in the tour, and with whom I spoke a lot. I had already been thinking to go past them and tell everything was just fine, now they came first. I immidiately offered drinks and we went out to have Pisco Sour, at some place they knew. Later we went to eat. Daniel is dutch and Christel is portuguese, but lives in Holland. She speaks spanish like a native and we enter a tiny restaurant where she persuades the lady to find some extra chairs, because there is one vacant table. They speak together in a mixture of portuguese and dutch. When it's not english because I speak english. We are having a cosy night, they want to go south sometime in the morning and we end up swiching maps. Danniel has already offered me their map of Altiplano (Chile, Peru, Bolivia). I can just send it, whenever I return to Denmark, and as I don't need my map of Chile anymore they have it. I had to have two cups of coffee this morning. A light headache vanish quickly. 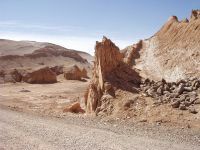 Today I'm going through 'Valle de la Luna', Moon Valley. In some maps the road is paved, that's not true, it's very bad, but the valley cutting through these mountains is really fantastic. The sand dunes goes all the way up the mountain at some locations at others the top of the dunes are the highest point. Softer parts are covered with a uneven grey bubbling layer of salt, at one side I can see how the salt has crystallised and blinks to me in the sun like a thousand mirrors. Unfortunately the wind is not at my tail today. It comes in uneven violent blows, which tend to regular sand storm at times. For a long straight distance the wind threatens to stop me. It wasn't blowing that much this morning at the tent, and I hope is doesn't now either. At other locations harder rocks have been cut into strange sculptures or long slim, jagged walls. After nearly being rolled over by the wind and I've had to put down my feet, I seek shelter to write this, but the wind is all over. It goes on howling. I eat lunch at a location I name "elephant foot valley". When I'm back home I find the tent still standing. Go to a museum late in the afternoon. Very interresting building. Formed like a star. But only once an explanation in english. I use my dictionary a lot and learn new words, but it's tirering too. 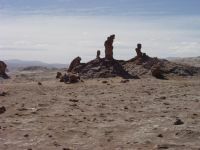 It's about the settlements in the Salar and their development from prehistoric time until now. At sunset the wind ought to lower and just as it seems so it raise again. At last 9.30 p.m. it's quiet. Just for the night? Tomorrow I'll go south to meet the flamingoes. Some newcomers at the site make as much noise as their predecessors. And they are even families. I don't care. But I don't try to be quiet when I get up to pack at 7.30 a.m.
What's on for today? No water. No shower. I just make it washing my hands in what's left in a 2 l's mineral water. I have 2 l's of juice and 1� l of water. I buy 1� l's of juice just in case. Have to pass by at the border police to tell them I'm not crossing Paso Jama into Argentine, but south instead. 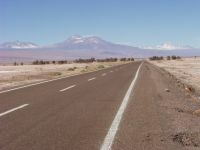 The road goes straight, decline a bit but the Salar is almost flat. The legs are functioning surprisingly well. I'm getting used to the height. It is when it comes to all 2400 m. I impress myself by going more than 30 km/h for a distance. Then I'm breathing heavily too. The sun is shining from a clear sky and there's just a light breeze. After 5-6 km I'm overtaken by a pick-up with chairs. It enters a location filled with cars. Besides there's nothing except some dry plants and a few trees. First I believe it to be a football match. No, there are flags and the sound of music. The music makes me think of Albania 1974. It's march and motherland-like. It looks like a pump house, maybe it's the opening. Doesn't look quite new thou, but after the dust storm we all look a little used. I've started using the lip salve often. Now I just need to buy some vaseline to replace the lost one. a very special tree, maybe an old one? But from a distance I realize. The dark line I've been seeing in the horizon is trees. Lots of trees. A forrest? When I arrive that seems to be the case. The trees are spread more than we're used to, but trees can be seen in all directions. A camper is parked and a booth selling handicrafts, but besides noone, what surprises me, because all this fertility could be basis of people living? But maybe the water that the trees live from is too deep for harvesting crops. They are thorny bastards too I find out when I put my bike up against one and afterwards have to pick out thorns from the tyres. Luckily none have passed all the way through. in the distance. So that's where it is, probably! 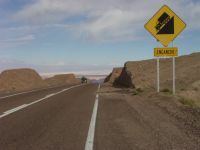 After having crossed a gravel dessert where I later come to stay overnight, the road turns and goes to the middle of the salar. There is some kind of vegetation, if that's the word. 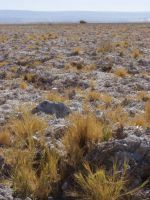 On a brown earth covered with a whitish layer of salt there are a few species surviving, especially a dry, yellow, hard type of grass. The longer I go the fewer there are. In the end there's just the brown earth and the white salt and then suddenly appears Conaf's small cottage and a moment later I park there. There is also a small parking lot but besides just a footpath straight ahead and there I now see the water and some flamingoes. I pay my 2000 fill my bag with binoculars, diary etc. drink what's left of the second bottle and walk ahead fast. The girl explains about another path to walk, but I havn't time, I have to go and see this mystery in the middle of the end of the world. They're trotting majesticly searching the water. They're reflected in the water and seen with the mountains in the background, it's an overwhelming beatiful sight. I see some more at the other direction further away. Maybe they can be watched from that other path? So I hurry back. That's very interresting. At a small pond where these diatomers and another type of algas, by which the flamingoes are fed, can be seen closely, I find a black lizard with red spots much to my surprise. According to the text it might be a newt? Then I see a lizard in another color. I take a photo and hurry on. At the last location the flamingoes are still far away, so I need the binoculars. And this small binoculars enlarging 10 x really puts things right. 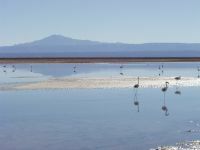 Not only can I now see the beaks of the flamingoes in a harsh yellow color and the red legs and pink neck, behind the snowcapped Andes rise to complete the picture. How the distant mountains through underground sources fill this laguna with the water, that makes life possible in this far away biotop, is not clear. But it's a remarkable sight, and I'm filled with enthusiasm and gratefulness to experience it. I stand there for so long that a german family and their guide catch up with me. They borrow my binoculars and get into talking. Now when I'm lying in the light from my front light writing and has been out watching the night sky above the Salar, I feel filled up, physically as well as psycically. Now I'll sleep. Goodnight. I had to go out to pee. The lights from Toconao are clearly seen, but it's also just 17 km away. But to the north San Pedro could be seen and 3 more places, of which the last must be Paine in the end of the Salar. It's 50 km at each side. I have to find out which the two last ones are.